On March 11, 2014, my life changed in a way that I would have never imagined. On that day, I was involved in a single car accident that fractured my spinal column, leaving my spinal cord severely injured. I was diagnosed as a T4 Complete Spinal Cord Injury, which means I cannot feel or move below my chest. I assumed the hospital stay would be tough, but thought that I would eventually walk out… literally walk out, and exercise my way back to health. I had no idea what it meant to have a Spinal Cord Injury. The moment the hospital staff first told me I would not walk again, I didn’t know what to say. I just kept looking at my mom for her to tell me it was going to be okay. I refused to believe what they were saying. Luckily, I had my family and friends to lean on, whether it was there at the hospital, by text, on Facebook, or in prayer. My family did research on physical therapy centers, and a family friend informed us about Santa Clara Valley Medical Center in San Jose. They have an entire floor dedicated to spinal cord injury patients. The hospital staff pushed me for six weeks to complete my THREE hours of therapy a day, lift weights, swim, do wheelies, participate in par course to do laps in the hospital, attend educational classes, and so many other things. Leaving the hospital was one of the hardest things I’ve had to do. Not only was I leaving my friends (the doctors, nurses, fellow patients), but I was leaving a place that was equipped with all I needed to train, exercise, learn and cope with my injury. Before I received the treatment, I was considered a “complete” injury, meaning no feeling or movement below my level of injury at T4. However, just a few days before returning home to the US, I was able to contract my upper abdominal muscles! A few months after the treatment, my doctor told me I was now an “incomplete” injury because of my movement and sensation I had regained below my level of injury. My family realized that we needed to return for another round of stem cells as soon as we could afford it. In February 2016, I was able to return to Central America for a two week treatment. Since then, I am able to contract my abdominal muscles, engage my obliques, and I gained sensation on my entire left side. For example, I can feel light touch or even the wind blowing on my left leg! I was recommended to return for a third treatment and I can’t wait to see its benefits! However, I can’t simply rely on stem cells to regain sensation or movement. I have to work hard during my physical therapy sessions at Break the Barriers, as well as maintain a healthy diet. 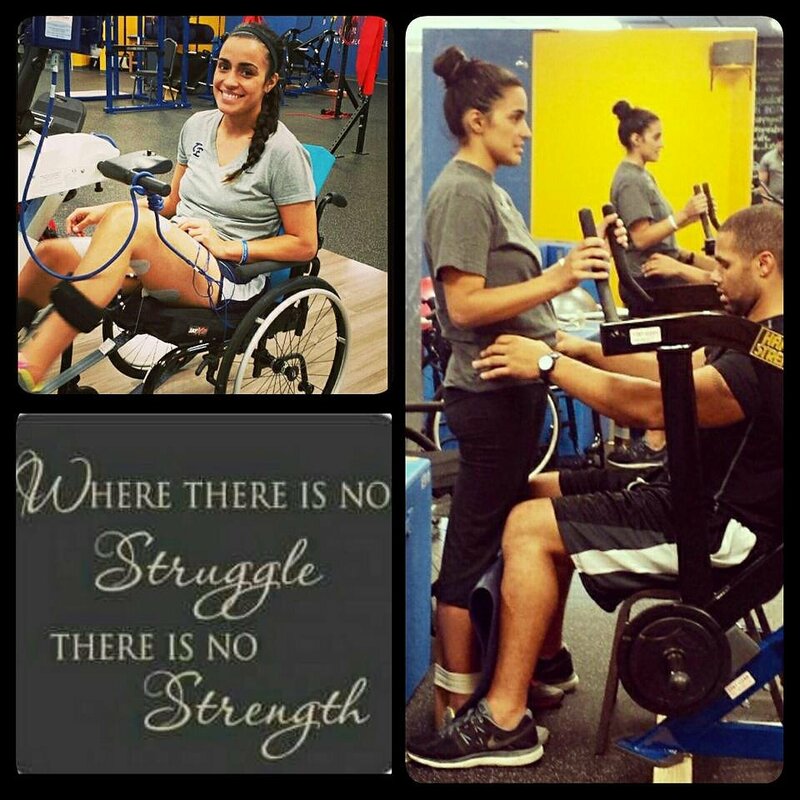 Without putting in work at the gym and therapy, I would not have been able to regain what I have. Relearning how to walk is one of the hardest things I have ever done. For now, I walk completely assisted. There is no doubt in my mind that I will one day walk again. My heart is so full knowing that I have the support of my family and friends. 5 years ago marks a day in our families lives that we will never forget. Looking back we remember this day not for anything negative but for the day that my sister, Melissa Anaya survived a traumatic car accident. I’ve always been proud of my sister but she stills seems to amaze me everyday! For those that have been following my sister through this journey there is still a lot you probably don’t know but she’s still making strides and improvements everyday. Last year for her birthday she told us and herself that she wanted to start driving again and take a trip all by herself, that those were her goals for the year. 2 months later she had her drivers license, bought a car and her adaptive driving equipment installed. Another month later she traveled all by herself to Kansas to visit her college friends for a week. A couple months later she traveled to Colorado to attend a camp! She accomplished her goals in less than 4 months… And I’m still working on my New Years resolution from 2010! She’s just absolutely amazing! Don’t get me wrong there’s struggles everyday but she makes them look so easy that sometimes we forget how hard she has worked and continues to work to live her life. So today, I look back 5 years and look at our lives today and thank god for the amazing life that he has given my family. Thank you all for your love and support you’ve shown my sister and my family! It’s been a couple months since I have posted but it definitely isn’t due to lack of activity. I am working out with Steve Sobonya, physical therapy, and recently started swimming at GB3 as well. Once I’m done with my workout for the morning, I head over to help out at my parents office or go visit at our restaurant in downtown. Life has felt more like…. Life. I have moments where I force the smile on my face when I’m in pain, frustrated with spasms, etc. but that’s all that I allow it to be, a MOMENT. I don’t stay at home every day like I was last year. I workout, work, and hang out with friends. I even helped toward the end of Clovis East’s volleyball season (Div. 1 Valley Champs!!! A couple weeks ago, I had to cancel my therapy at Project Walk (you should all know by now that I love my sessions at Project Walk)…I keep getting infections that are causing me to have AD (Autonomic Disreflexia, which is a way my body tells me that something is wrong). My blood pressure was sky high, my spasms were super crazy, and I would have a fever. It was not fun. Doctor sent me for xrays and ultrasounds to see if there was a more serious underlying issue.. but results showed that I was in the clear. One new medication later, I started feeling better! Back at it at Project Walk, as you can see in the picture on the right, I am standing with my trainer on a power plate. This machine vibrates your ENTIRE body. Once I get past the awkwardness of my head vibrating, this power plate helps me connect to the lower half of my body. My right leg is slacking a bit, but my left leg feels a lot! ANYWAYS I was standing pretty gosh darn straight. Which felt awesome! You guys know that feeling you get when you beat personal record, or complete a big project at work or school? It feels awesome right? That’s the excitement I get (and my trainers get) when I am able to stand straight.. Especially when I’m able to stand “completely unassisted,” no straps around me, no trainer holding me. Then to get my name up on that milestone board as I posted in that top left picture! Get ready to see more pictures of my accomplishments on that board! I promise I will post more guys.. Even if I have to report the bad stuff. With heterotopic ossification in my hip (abnormal bone growth) and dealing with severe spasms, I am made it to Project Walk this week. While standing, I was able to shift my weight from side to side without using my arms.. Which should be pretty hard with no control of your core, right? Yet I can feel core muscles contracting while doing the shifting! The session on the treadmill at Project Walk was hard to top, especially for me! It was incredible to watch my daughter walk on the treadmill, even though she was completely harnessed and her legs were being aided by the therapists. The last two weeks Melissa has surpassed equally exciting milestones. She is able to stand up from being in a sitting position, all on her own. Additionally, she is able to let go of the hand bars and balance herself in the standing position for short periods of time. 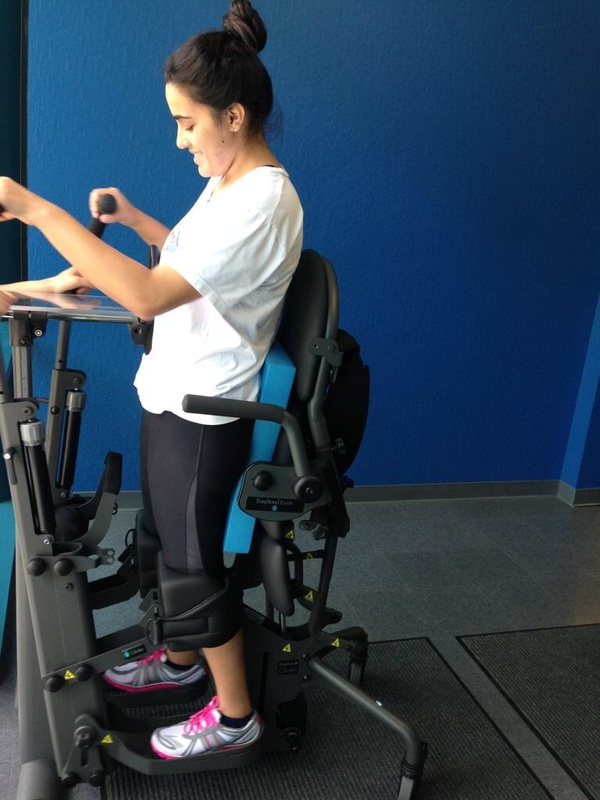 She is able to have her spasms work in her favor and help her push through the stationary bike. I see the therapist helping less and less! Yesterday she did planks and push ups with minimal help from the therapist. What a work out! I was tired just watching ! Equally exciting is the fact that Melissa is having more and more constant sensation in her left leg! So exciting to watch! How can we not help the sweetest people we know? You should help too.